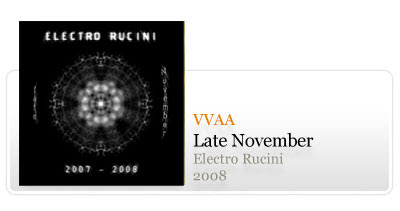 A netlabel nacional Electro Rucini que iniciou a sua actividade no passado ano em Novembro e que já conta com 59 edições, decidiu terminar o ano de 2008 com mais uma edição desta feita uma compilação intitulada "Late November". Electro Rucini is a new NetLabel established in November last year and by now, 11 December 2008, already released more than 60 items under the collection initiative. Is it time for a compilation? Gathering the singular creators in one single LP? Is it time for celebration? One thing is for sure this is the time for action and the action is to listen. Pan-Electro-Music touching the distant spots of a new dawn. Late November in early December is an unconditional release.